The latest news that Australia is going to be able to convert the Australian Dollar directly into Chinese Yuan and RMB (renminbi) is set to begin the end of the US Dollar being the international currency reserve. The direct conversion is going to make trading with China easier and cheaper for both countries as they do not have to consider the different charges between buying and selling from one currency into US Dollars and into the other currency. The international reserve currency is not a status that a currency is able to hold onto forever. 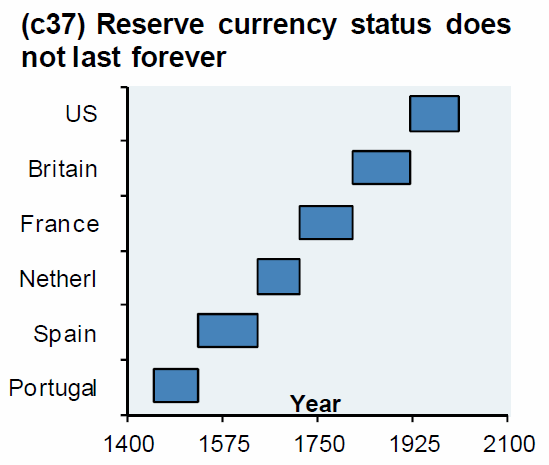 The graph below indicates how the reserve currency has changed over time. This confirms that China is set to chip away at the dollar’s reserve currency status, perhaps the next international reserve currency is going to be the Yuan after all, despite many being skeptical that it would actually happen. Australia has set the precedent and many more countries are expected to follow, allowing countries to trade directly with China. The full article on the currency changes can be read here.